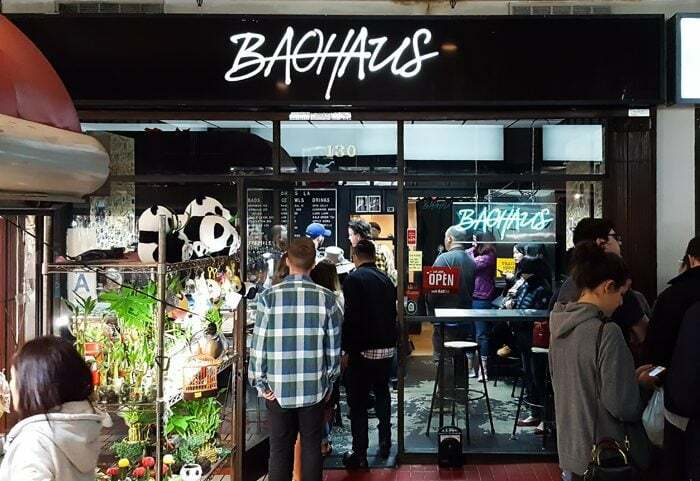 Baohaus, a restaurant by Chef Eddie Huang that specializes in Taiwanese steamed buns, opened a location in Los Angeles last year (the original one is in New York City). 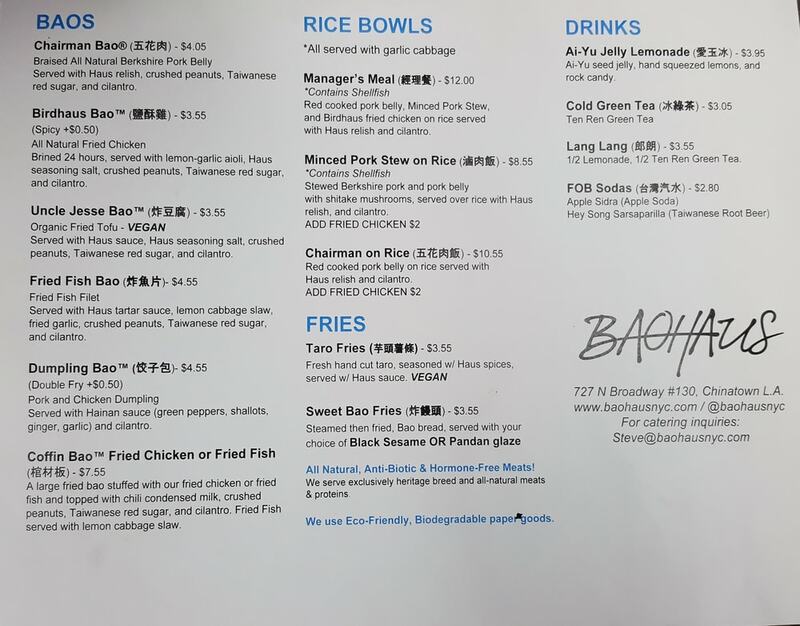 After reading Fresh Off the Boat: A Memoir and watching the tv show Fresh Off the Boat, which is inspired and loosely based on Chef Eddie Huang’s life and book, I have been wanting to try Baohaus, so I was very excited when he decided to open a location in Los Angeles. Located in Chinatown, the tiny restaurant is next to Howlin’ Rays. 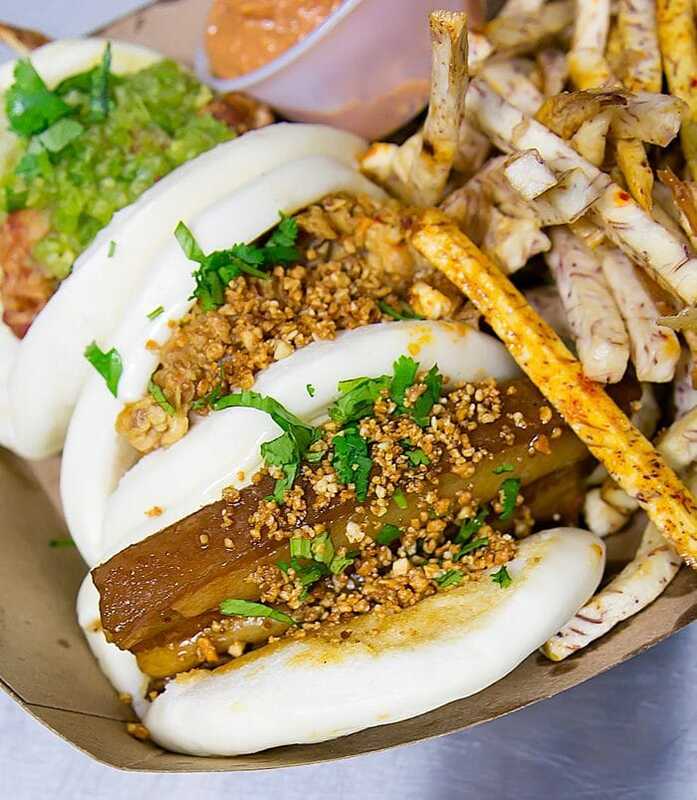 The restaurant has a very simple menu, offering variations of the Taiwanese gua bao, a popular street snack that consists of a steamed bun traditionally filled with pork belly, crushed peanuts, pickled mustard greens and cilantro, though there are other filling variations as well. 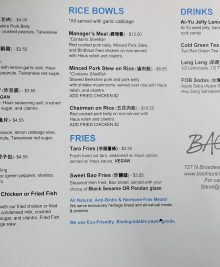 If you want to try a variety, the best option is to get their lunch special which allows you to choose 3 baos and fries for $14. 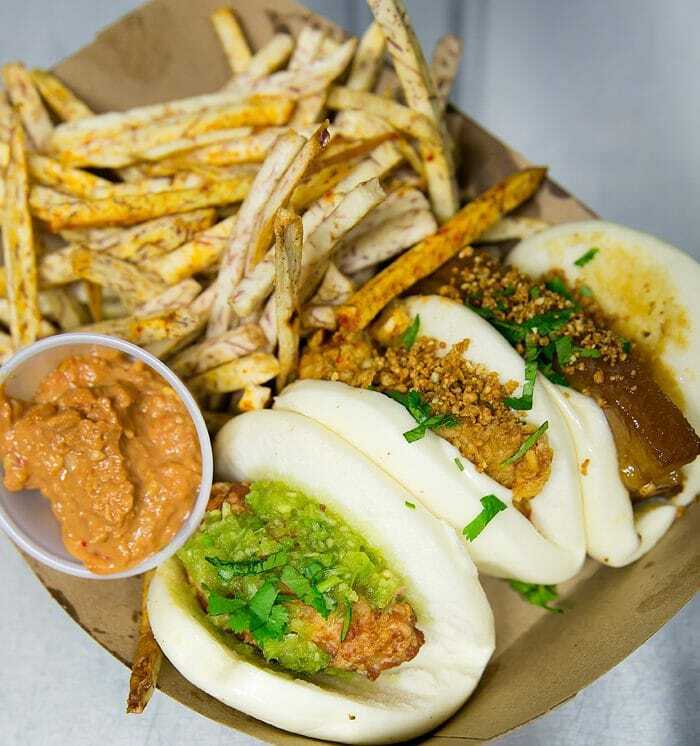 We chose Chairman Bao®, Birdhaus Bao™ and Dumpling Bao™. Chairman Bao® features braised all natural Berkshire pork belly served with Haus Relish, crushed peanuts, Taiwanese red sugar, and cilantro. This is their version of the classic Taiwanese gua bao. Of the three, Chairman Bao was our favorite. We enjoyed the generous slice of tender braised pork belly. 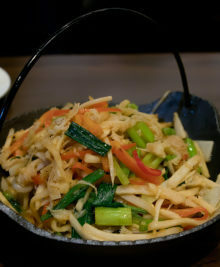 The traditional accompaniments added texture and balanced out the richness of the pork. 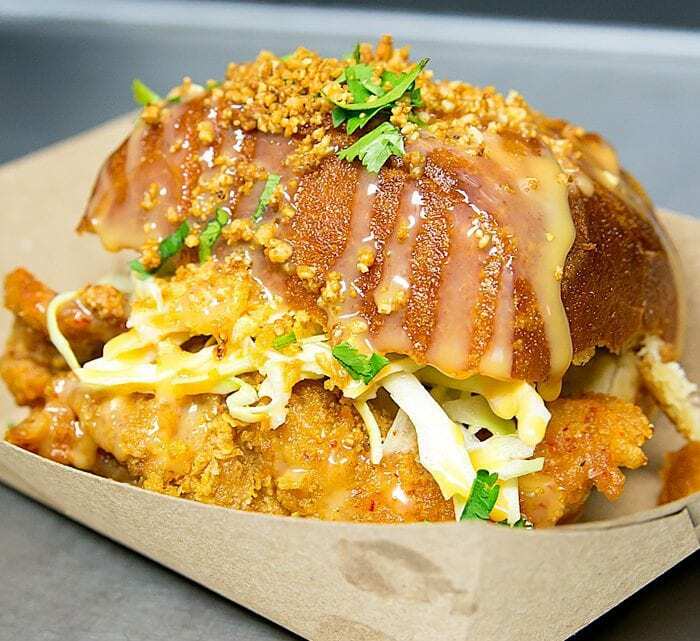 Birdhaus Bao™ is filled with all natural fried chicken, served with Haus Seasoning Salt, lemon-garlic aioli, crushed peanuts, Taiwanese red sugar, and cilantro. While the chicken was juicy and crispy, this one didn’t quite stand out for us. Dumpling Bao™ consists of a pork and chicken dumpling served with Hainan sauce (green peppers, garlic, shallots, ginger) and cilantro. I enjoyed this one as well. The dumpling was packed with flavor and provided for a fun and unique bun filling. 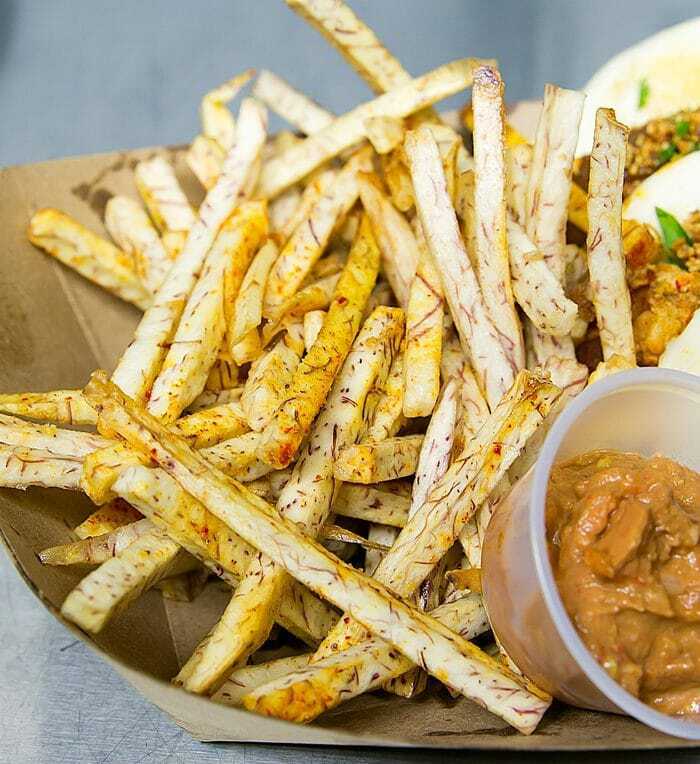 Fresh hand cut taro, seasoned with Haus spices, served with Haus sauce. The first few I ate were great, though they felt a little plain after a while. They did have a nice crunch to them though. I also couldn’t resist ordering this massive creation. A large fried bao stuffed with fried fish, lemon cabbage slaw and topped with chili condensed milk syrup, crushed peanuts, Taiwanese red sugar, and cilantro. This was dessert and lunch stuffed into one and I while I normally don’t like mixing the two, this combination somehow all worked together. The fried bun was carb heaven with its fluffy interior and golden crispy surface. It was even more enjoyable with all the toppings. Overall, we had a nice visit here. I haven’t really found many restaurants that serve Taiwanese gua bao outside of Taiwan, so it’s nice to have a restaurant introducing this popular dish to the US. Nice! 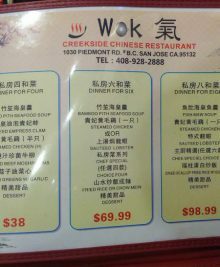 I saw this place featured in a Fung Bros video which was so so tempting, except we haven’t been to LA in years! Glad you enjoyed the visit and shared a little knowledge about Taiwanese baos! you should totally make an LA trip! so much to eat there!